Three scale insects feeding on Coat Buttons, an exotic composite weed in Nairobi, Kenya, April 2011. This scale insect appears to be a kind of Felt Scale, Eriococcidae. Scale insects are immobile to barely mobile and soft bodied. 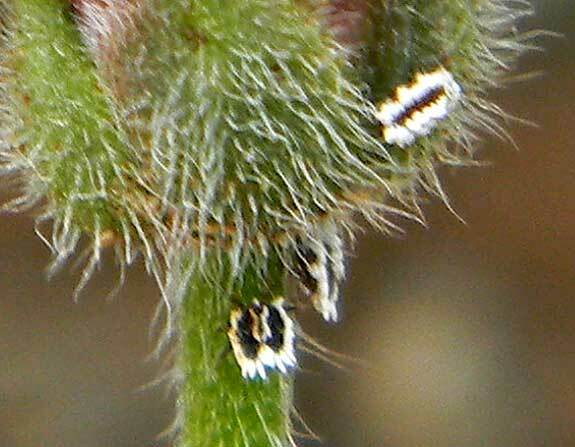 Lady beetles and small parasitic wasps are among the predators that would normally find these bugs very easy to take. The defenses of scale insects are varied with some containing irritating copounds derived from the plants or else a thick coating of inedible wax. Scale insects feed by inserting a hypodermic needle-like set of mouthparts into plant tissue and then pumping out sugary phloem fluid. This plant juice is high in sugars and short on proteins and this leads to scale insects post potent defense: an alliance with sugar-loving ants. Scale insects excrete the excess sugars which the ants take for food. The ants then protect the scale insects much as herders protect their cows. The ants can sting or spray formic acid to repel scale insect predators. If you have biological or taxonomic information about these insects please share using contact information at bottom of this page.